Except for Walsenburg, the placenames listed above are rather obscure, and many maps do not label them. Ucolo is a few miles off US 491, on the stateline between Monticello UT and Dove Creek CO. Crescent Junction is a tiny settlement at I-70's interchange 180 (some maps label the site "Brendel", probably after a nearby railroad siding). 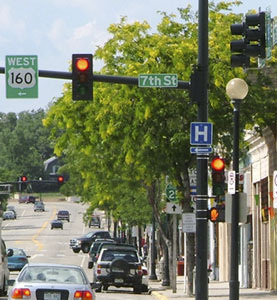 Valley City was about five miles south of Crescent on US 191. Nothing is there today, but historically the site marked the terminus of US 450, at its junction with US 50. The large photo at the top of this page is from an old postcard, and was taken looking the same direction. 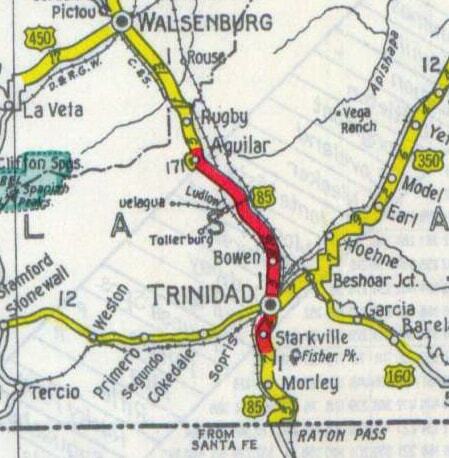 In about 1933 the US 160 designation was extended north with US 85 from Trinidad to Walsenburg. From there the designation replaced US 450 all the way west to the Utah line (from Cortez, US 160 originally went northwest through Dove Creek, instead of southwest through Four Corners as it does today). 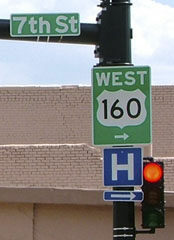 Apparently at the Utah line US 160 ended, and it was US 450 that continued up to Crescent for the next five years or so, until US 160 replaced US 450 in Utah as well. So until about 1939, the "east" end of US 450 (even though it was now almost entirely a north/south route) was at the state line near Ucolo.